Side effects are a very real concern for people taking Aspirin, and they range from very mild to severe. The mild side effects occur more commonly and include heartburn, nausea and upset stomach. Less common but severe side effects include drowsiness, persistent vomiting, bloody stools and severe stomach pain. These side effects are not considered dangerous, but they should be reported to a physician if they become severe or if they persist for more than a day or two. Most people taking the medication found that the side effects they experienced were very mild and did not justify them stopping the medication. Aspirin that has been buffered—or developed in such a way that it is easier for the body to absorb—often carries fewer side effects than the powdered or standard tablet variations. Anyone experiencing any of these severe side effects should seek immediate medical attention, especially in the event of an allergic reaction. There are medications available that can counteract the effects of Aspirin in the body in the event of allergy or overdose. Although Aspirin is generally considered safe for children ages 12 and under for the relief of pain and swelling associated with injury, there are some concerns about its use for fever or pain associated with cold or flu-like symptoms due to the increased risks of developing Reye’s syndrome. This often deadly disorder is thought to be triggered by the use of Aspirin to treat viral disorders like chicken pox, flu and the common cold, but the disorder itself is not completely understood. In the 1980s, the CDC—or Center for Disease Control—began advising parents against using Aspirin in children and pre-teens when flu or cold symptoms were present, and the instances of Reye’s syndrome dropped. Aspirin, like all other NSAID medications, is known to cause increased risk factors for bleeding due to its blood thinning properties. In elderly patients, this side effect of Aspirin is often exacerbated due to age-related thinning of the stomach and intestinal walls. There are some clinical trials that suggest the risks of Aspirin side effects may be greater than the benefits provided to elderly patients. People over the age of 65 who are taking aspirin should be closely monitored by their physicians and should understand that serious gastrointestinal issues can occur suddenly and without warning. 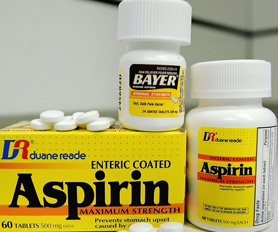 Perhaps one of the most beneficial side effects of Aspirin is its ability to thin the blood, and this is often exploited by adults who are at high risk for heart attack or stroke. In the event of heart attacks and strokes, blood clots form in the arteries and prevent blood flow to the heart, brain or lungs. Aspirin prevents these blood clots from forming by binding to platelets so they cannot adhere as easily. A daily maintenance dose of 81mg is very commonly prescribed to those who have a family history or other risk factors for heart disease or stroke, and studies have shown that someone suffering from a heart attack should chew up a single 325mg Aspirin tablet in order to increase their chances of survival. Aspirin has been used for centuries to reduce pain and swelling—even before the days of modern medicine. Aspirin is truly a wonder drug when it is used correctly and the side effects of Aspirin are monitored and recognized properly.